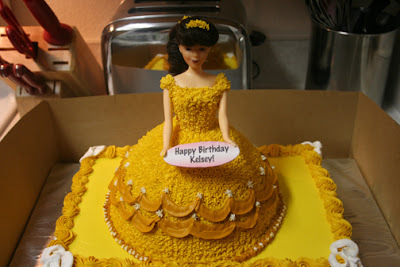 This cake was made for my friend Tricia's daughter, Kelsey. She is turing 3 and requested a Disney Princess theme. She went back and forth a few times on the princess she wanted so Tricia told me to just pick one. I decided to make Belle because the doll torso/heads that you can buy at your local cake shop/craft store are pretty generic and this one looked closest to her. The 1/4 sheet is french vanilla cake with raspberry filling and the "dress" of the cake is french vanilla with no filling. All covered with vanilla buttercream. This was a fun cake to make even though it turned out a little more YELLOW than I'd wanted it to. I'm happy with the results. 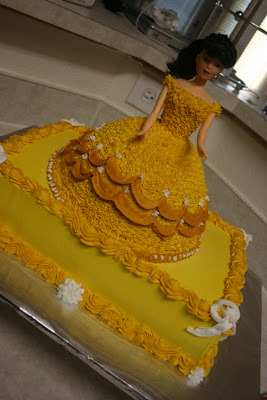 Plus, Rodney said it looks like Belle, which is all the approval I need. P.S - please excuse the toaster/other kitchen items in the picture, we're in the process of moving!